The LK-165 portable keyboard is the latest in the US market by Casio. With this keyboard, you can have a 61-key piano-style keys that light up and teach you which notes to play. Moreover, there are 400 built-in tones, 150 rhythms, 110 built-in songs, 10 reverb types, a sampling function, a 3.5mm mini audio input and a USB MIDI port for class compliant MIDI operation are available with this keyboard. The keyboard has come out with an AC adapter. However, you can also use batteries to make it work on power. 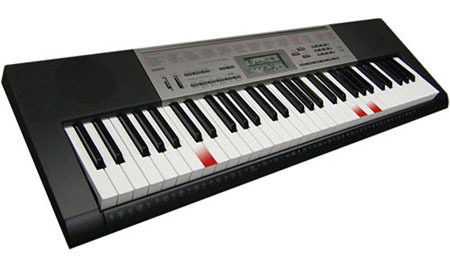 $129.99 is the suggested price of the Casio LK-165 portable keyboard.